When Moog Music announce a new synthesizer, the Internet buckles under the weight of lust, rumour, speculation and the wish-lists of those for whom the Moog name will never evoke anything other than unquestioning loyalty. I am more pragmatic than that. Nobody can question the importance of the Minimoog and Taurus pedals, and the likes of the Prodigy and Source deserve more than passing respect. But for every classic Moog, there was another that didn't quite earn its right to the name. The same is true today. The Voyager XL is an object of such beauty that it's sometimes hard to play it rather than just gaze, adoringly. Then there's the Slim Phatty; it's fair to say that we'll never be bosom buddies. So what of today's offering? Will the Sub Phatty add to the Moog legend, or will it join the list of "nearly but not quite” synths that bespeckle the company's history? Careful... It's Deeper Than It Looks! 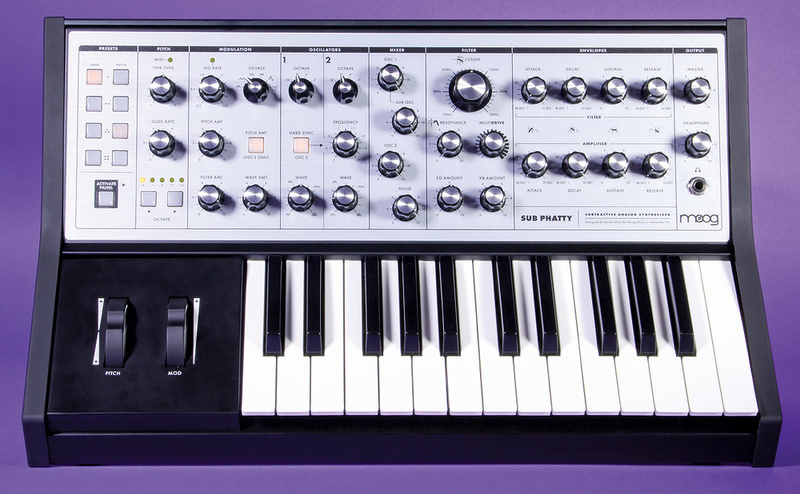 At first sight, the Sub Phatty is a traditional analogue synth boasting a knobby control panel, a 25-note keyboard, and standard pitch-bend and modulation wheels. All the things that you need for monophonic synthesis — oscillators, noise, a filter, dual contour generators and an LFO — are visible and, if you compare it with a vintage synth of similar form and function (say, a Prodigy) you'll find that it has significantly more facilities on its front panel. But, in addition to these, it offers no fewer than 51 hidden parameters, many of which are intimately bound up with the sound it produces. You'll soon be able to control these using the forthcoming editor/librarian software, but if this isn't to hand, you can access them using a Shift Mode in which some buttons and switches offer what, in the past, would have been called Page 2 functions, while other parameters can be accessed by pressing combinations of the Bank and Patch buttons, followed by keys on the keyboard itself. So, for example, if you want to change the filter slope, you have to press Bank 4 and Activate to enter Shift Mode, followed by Bank 2 and Patch 1 to access the appropriate parameter, and then the lowest C, C#, D or D# keys to choose one of the four options. It's not a particularly elegant system, but one of Moog's engineers explained it to me as follows: "People may wonder about the relative profusion of page 2 functions, versus the absence of panel labels for them. This was a conscious decision to keep the panel as clean and uncluttered as possible, so as to be minimally off-putting for newcomers to knob-per-function analogue panel design. If you approach the instrument as though the panel functions are all it has, it remains a complete and very playable instrument. If you're curious enough to delve deeper, you can consult the documentation when necessary, until you've internalised the whole layout. My own experience has been that of genuine surprise at how quickly I memorised the more commonly used shift functions. I hope others find it similarly convenient once they've gotten used to it.” I'm not sure that I fully accept this. With any conventional design, these functions would be accessed and programmed using a screen and a simple menu system. Nevertheless, it's a novel approach, and it could work. So let's find out if it does. Over the years, Moog's oscillators have been described as warm, lush and organic, but I'm more inclined to describe the Sub Phatty's as 'precise', because they do exactly what I ask of them. That's not a veiled criticism, and it certainly isn't a euphemism for 'thin'; a single Sub Phatty oscillator with a touch of PWM is a powerful beastie, especially in the lower octaves. Neither are the oscillators lacking in facilities. The initial waveform for each can be selected within a continuous spectrum from triangle to sawtooth to square to pulse and, in a manner analogous to PWM, you can modulate the waveshapes of Osc 1, Osc 2 or both, as selected in the Hidden Functions. Hard sync of Osc 2 by Osc 1 is also provided, and you can use the filter envelope to sweep Osc 2's pitch for the usual range of aggressive sync sounds. Each oscillator offers 16', 8', 4' and 2' settings and, in addition, Osc 1 incorporates a square wave sub-oscillator an octave below the standard pitch, while Osc 2 offers detune of plus-or-minus seven semitones with respect to Osc1. There's also a Hidden Function called Beat Frequency that allows you to dial in a fixed offset of up to +/- 3.5Hz to provide a consistent detune across the whole frequency range, and yet another initialises the oscillators to the starts of their cycles each time you press a key, so that detuned notes are reproduced consistently. That's a very nice touch. The Mixer allows you to balance Osc 1, Osc 2, the sub-oscillator and the synth's rather deep-sounding pink-noise generator before passing the audio to the Sub Phatty's resonant low-pass filter. This offers 6, 12, 18 and 24dB/oct modes, all of which will merrily self-oscillate when its resonance is high enough. 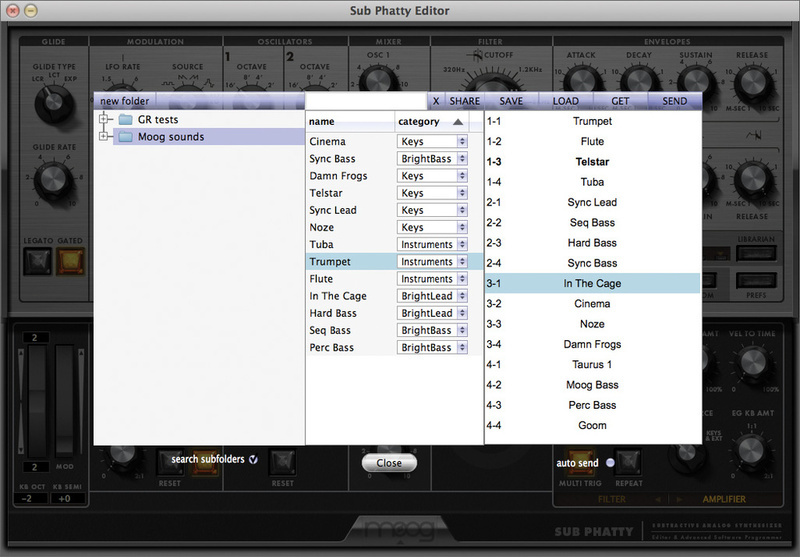 Although similar to the earlier Phatties' filters, there are three important differences between the Sub Phatty's filter and its predecessors'. Most significantly, the maximum cutoff frequency has been increased from 16kHz to 20kHz. (I tested this and, true to Moog's word, the maximum is now a tad over 20kHz.) Secondly, the range of keyboard tracking has been extended from a maximum of 100 percent to a maximum of 200 percent. But perhaps the most audible difference lies in the Multidrive overdrive circuitry. Previous Phatties used a single overdrive that clipped the signal asymmetrically to generate musically pleasing distortion. In contrast, the Sub Phatty has two distortion circuits, one lying before the filter, the other after. Moog claims that this leads to a "screaming snarl” at high amplitudes, but that's hyperbole; the distortion is always civilised and controllable, perhaps too much so. There are two ADSR contour generators, one hard-wired to the filter cutoff frequency (although also available as an alternative mod source in the modulation section), and the other to the audio amplifier. These are nice and clicky at their fastest, and I measured the maximum Decay and Release times to be of the order of 40s, which is much longer (and better) than Moog claim. Hidden Functions allow you to add a Delay before the Attack of each contour, and a Hold between the Attack and Decay stages, thus turning each contour generator into a six-stage DAHDSR device, but these stages work only in the (also hidden) looping mode, which draws its inspiration from EMS's Trapezoid Generator. Either or both contour generators can be set to loop, and they generate more sophisticated shapes than were available on the EMS VCS3 and its siblings. A host of further Hidden Functions include the trigger modes, which allow you to switch either or both contour generators between single- and multi-triggering, and the velocity-sensitivity parameters, which allow you to use velocity to control the envelopes' amounts as well as their Decay and Release times. Then there's the Filter Envelope Keyboard Amount, which allows you to quicken the contours' responses as you play up the keyboard, thus imitating acoustic instruments. Another pair of Hidden Parameters allow you to reset the contours to zero whenever a trigger is received, and you can set whether either or both of the contour generators are triggered by the keyboard alone, by the signal applied to the Gate In, or by both. You can also disconnect the filter, or the amplifier, or both from their respective contour generators to create drones and to process external signals. Unfortunately, there's only a single LFO, which precludes patches that, for example, combine gentle PWM with conventional tremolo or vibrato. It offers five waveforms (including sample & hold) with just five destinations: the pitches and waveshapes of oscillators 1 and 2, and the filter cutoff frequency. Once the maximum modulation levels have been set using the appropriate parameters, the amount applied is then universally controlled by the modulation wheel. Although the LFO legend on the control panel describes a range of 0.1Hz to 100Hz, another Hidden Parameter offers two further ranges: 0.01Hz to 10Hz, and 1Hz to 1kHz, the former of which permits languorous waveshaping and filter sweeps, and the latter suggests all manner of clangorous pitch- and filter-modulation possibilities. Further Hidden Functions offer LFO key sync, and MIDI sync ranging from one to 384 MIDI clocks per cycle. Ah yes... MIDI. Various Hidden Functions let you select which I/O port and channel are used, how incoming MIDI streams are merged with the data produced by the synth itself, and what data (if any) is filtered from the output. Happily, the physical controls send MIDI CC messages, so you can record and replay performances that include flourishes such as manual filter sweeps. There's also a high-resolution mode that increases the number of quantisation levels of the most important parameters from 128 to 16384, so values can be stored and replayed at such high resolutions that zipper noise is inaudible. There are just 16 memories, selected using the Bank A-D and Patch 1-4 buttons. Saving patches is trivial: just press and hold one Bank button and one Patch button for a second or two. If you find yourself going down a blind alley (sound-wise), you can initialise the current preset using another Hidden Function or, if things are going particularly badly, you can reload the factory sounds. On the other hand, if you've created a sonic masterpiece, you can dump it as a SysEx file, or dump all 16 patches for later recall. Another group of Hidden Functions allows you to control the nature of the portamento, selecting between standard and legato modes, with your choice of constant rate, constant time, and exponential responses. There's also an unusual function called Gated Glide. When off, this allows the Sub Phatty to continue its glide toward the target note even after you release the key; when on, it stops the glide at the point it had reached when you released the key. Yet more Hidden Functions allow you to transpose the keyboard and to set the maximum pitch-bend range (independently for Up and Down) between one and 24 semitones. Another allows you to specify whether the loudness of a recalled patch is determined by the current setting of the master volume knob or by the level contained within the stored parameters, while yet another allows you to specify whether the modulation depth is controlled by the current position of the mod wheel or its position when you saved the patch. And, finally, another sets the knob mode: Pass-through, Relative, or Snap. Of these, I preferred Relative mode, because the parameter value 'catches up' with the knob's position when you start to turn it, and that feels natural to me. The Sub Phatty is chunky, heavy and appears to be extremely well built, with positive buttons and wobble-free pots. It also has an internal PSU and an IEC socket, so there are many reasons why we should be friends. The small, black legends embossed on its black end-cheek make it impossible to read which hole does what, unless you have the visual acuity of a kestrel, but I soon had everything hooked up correctly, so I switched it on. 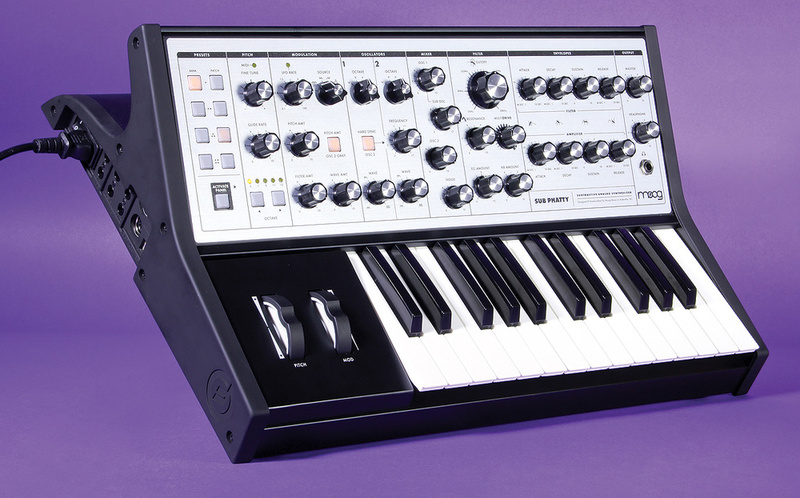 Moog make a big deal over the Sub Phatty's short warm-up period, and it's clearly superior to many other synths. Now it was time to create some sounds. I put the synth into 'panel active' mode so that the sound reflected the positions of the knobs and switches, and started to experiment. It soon became clear that things weren't sounding as they should, and I quickly tracked this down to the settings contained within the Page 2 parameters and the Hidden Functions. So I used another Hidden Function (Initialise Preset), and yet another (Initialise Global Parameters) to ensure that I could build the sound I wanted using the front panel. After a few moments, I was ready to start again, so I programmed a standard Moog trumpet. This is a very simple patch, but few other synths deliver it the way that a Moog does. The Sub Phatty passed that test with flying colours, so I moved on to other standard sounds such as flutes, basses, and solo leads. By this time, I had printed out all 14 pages of Hidden Functions and pinned them to the wall alongside my work area, and I have to admit that I would have been lost without these. Happily, just before I submitted this review, Moog Music supplied an 'alpha' version of the forthcoming editor/librarian. I connected my MacBook Pro to the synth via USB, updated the Phatty's firmware as instructed, then launched the application. Despite being developed and tested on OS 10.7.5, it ran without problems under OS 10.6.8. Given where this version lay in the software development cycle, this was laudable. 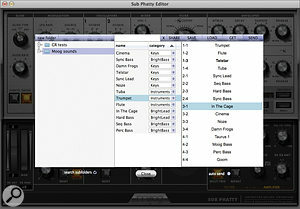 The Sub Phatty's editor/librarian software, which should be available by the time you read this. The editor works bi-directionally meaning that if you turn a knob on-screen, it affects the sound generated by the synth in real time; and if you turn a knob on the synth, it updates the position of the representation within the editor in real time. The latter is particularly useful, because it means that you can tweak sounds on the physical control panel and immediately save them using the virtual one. Plug-in versions are also in development, which means that DAW automation will also be available in the not far distant future. The Librarian lies behind the editor, and is based around three columns (see screenshot elsewhere in this review). The rightmost contains the patches held within the synth itself, the leftmost displays your libraries, and you name sounds and allocate them to categories in the centre. It's simple, and it works. Just drag a sound from where you find it and drop it where you want it to go. Having the editor to hand made almost everything about the Sub Phatty much slicker, but I still wasn't enjoying it as much as I thought I should. It was obvious why. For me, a 25-note lead synth is little better than a two-string guitar, so I shoved one end of a MIDI cable into the Moog's MIDI In, and the other end into the MIDI Out of a nearby five-octave keyboard. I then selected one of the lead sounds I had already created and... wow! It's not generally appreciated that, like many orchestral instruments, a small number of synths (such as the Minimoog) exhibit subtle changes in register as you play a sound across a wide range of pitches, and this is one of the reasons why the Minimoog sounds so much more human than many other synthesizers. The Sub Phatty exhibits this attribute too, but you won't be able to take advantage of it from a two-octave keyboard. I now reprogrammed the Sub Phatty with renewed energy. I experimented with filter slopes to extract tones reminiscent of early Japanese synths. I created responsive, velocity-sensitive patches, and others based on the self-oscillating filter (which can track the keyboard perfectly), gently overdriving the amplifier to create a different range of timbres. I used oscillator sync to create tortured lead and bass sounds, and I programmed the usual selection of zaps, splats and ray-gun effects. I also found that — despite some people's fixation on overdrive — lower, undistorted levels led to beautifully smooth, archetypically Moog-y lead sounds. I then found it fascinating to save four versions of the same sound, just changing the filter slope in each. Not only was the initial timbre of the patch changed, but this also altered the way that, for example, the overdrive modified the character of the sound. There's something unusual and appealing about Moog's filters in their one- and two-pole modes, and some excellent sounds are lurking there. By this point, the Sub Phatty had proved to be totally reliable (this was a production prototype, remember) and it was also starting to sound very good. Indeed, it seemed to me to be markedly superior to the Little and Slim Phatties. This was not just a subjective judgment; there are many objective reasons why this should be so. For example, you are no longer constrained to modulating both oscillators' waveforms equally, and velocity can now control the loudness of a sound as well as its brightness. There's also the addition of the noise generator, and the higher maximum filter cutoff frequency clearly increases the sparkle of some sounds. Consequently, I would never have named this synthesizer the Sub Phatty. It's not limited to bass synth duties and, although many functions (too many, in my view) lie beneath the control panel, it's still more 'hands-on' than its predecessors. What's more, the word 'Sub' implies that the new model resides a few places below the other Phatties in the sonic league table, which is wrong. Of course, there are still areas in which it could be improved. For example, the omission of aftertouch is a fairly major disappointment, and I am not the biggest fan of the Multidrive, which needs to be hotter if it's to create the screaming snarl promised by Moog's blurb. On the other hand, while I can imagine some potential users bemoaning the lack of an arpeggiator or step sequencer, that doesn't bother me a bit. The world doesn't need another synth that can go diddly-diddly-diddly until the lights go out, and if you want to take advantage of such things, you can always use MIDI or the CV and Gate inputs to drive the Sub Phatty from elsewhere. 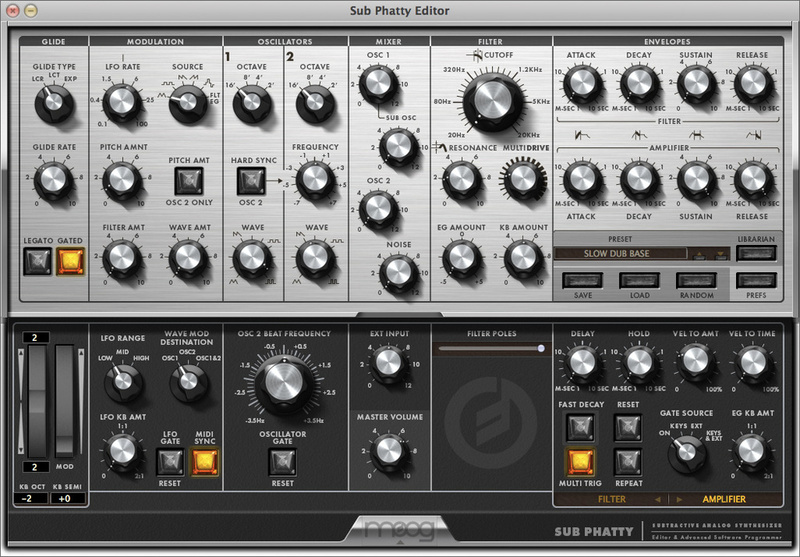 The Sub Phatty isn't a ground-breaking synthesizer. We were playing instruments with the same underlying architecture in the early 1970s. Consequently, it produces sounds that have (to a large extent) been heard before, although it should be said that they appeal as much in 2013 as they did in 1973. So where does it fit into the synthesizer universe? Moog's President is clear on this point. He has stated that, "We set out to design the grittiest Moog synth ever, one that still offers all of the great sound and flexibility that Moog synthesizers are known for, but that also really has teeth.” I'm not sure that he meant to imply that no previous Moog synthesizer "has teeth”. Given that people have been playing Minimoogs through 100W Marshall heads and 4x12s for more than 40 years, it would be brave to suggest that anything has longer and sharper teeth than that! In contrast, I found it impossible to pigeonhole the Sub Phatty and, given the rather arcane programming system for its Hidden Functions, and its short keyboard, I eventually found myself approaching it on three levels. The first was, of course, the synth in isolation. It is possible to program the full parameter set using its Shift Mode and play it in limited fashion from its two-octave keyboard, and for some users — particularly those who class themselves as producers and sound designers — this will be fine. (For some users, the front-panel parameters alone may suffice.) The second stage was to add a computer and the editor/librarian. Moog are promoting the Sub Phatty as "streamlined”, and "ideal for beginning synthesists”, claiming that "virtually every function on the Sub Phatty has its own knob”, which is palpably untrue; the software greatly eased programming, as well as making it possible to work with a much greater number of patches. The third was to treat it as a sound module, using a longer keyboard to play it in the way that its sounds deserve. For me, this begs the question, why didn't Moog design it as a full-sized synth or a desktop module in the first place? Indeed, why didn't Moog design it as a full-sized synth or as a desktop module with a small screen and a conventional editing system? I suspect that I've already answered the first question; not everybody is a fully paid-up member of the widdly-widdly society. But for those who are, an (albeit more expensive) Super Phatty sporting a 49-note keyboard would be a more attractive proposition. As for the second question, I suspect that the omission of a screen and its associated navigation controls may have been necessary to keep costs down — and to keep the size down to the current footprint. So, finally, we come to the question of price. The Sub Phatty is not cheap, and you can buy two Arturia MiniBrutes for the same cost, or a Korg MS20 Mini and a MiniBrute for little more. 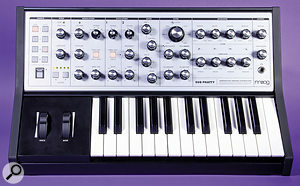 But neither of these alternatives sounds like a Moog and, for many players, that may outweigh all other considerations. 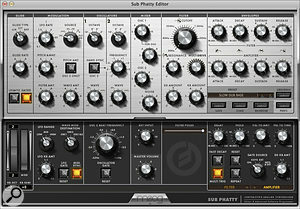 If the shape and style of the Sub Phatty fits your needs, you'll find it to be a fine-sounding synthesizer. The Arturia MiniBrute is the obvious alternative to the Sub Phatty. Both are based on two-octave keyboards (although the MiniBrute's has the distinct advantage of aftertouch), both make more than a passing nod toward bass synthesis, both are solid and robust, and both sound great. Ultimately, I suspect that the Moog's greater price will limit its appeal, but there will nonetheless be many potential customers for whom the sound of a genuine Moog is far more important than its cost. Most of the I/O on the Sub Phatty is located within the left-hand end cheek. In addition to MIDI In and Out on five-pin DIN sockets and via USB, this includes the line-level external audio input and the audio output, both on quarter-inch jack sockets. 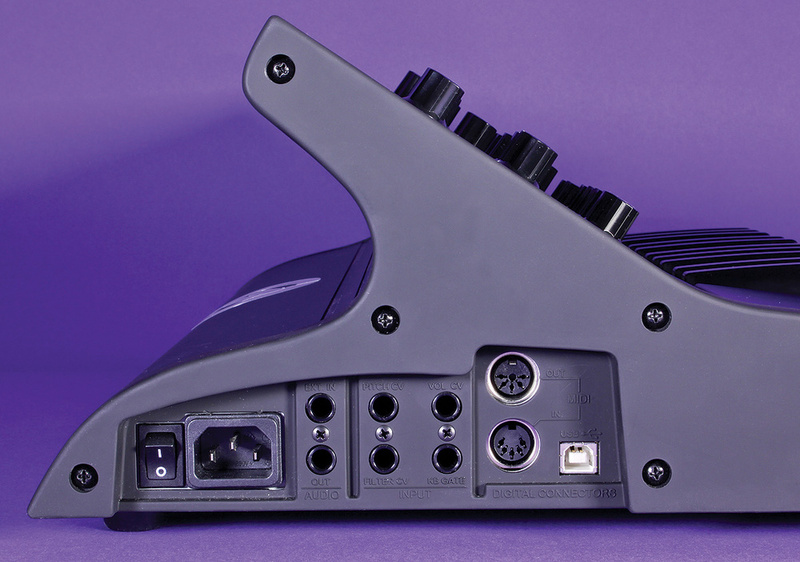 There are also four analogue control inputs. The first is a +5V Gate, while the other three control the pitch (1V/oct), the filter cutoff frequency (also 1V/oct), and the output volume. 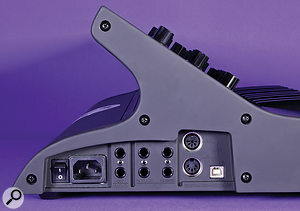 The headphone socket is located within the output section on the control panel, but this is one area in which the Sub Phatty is inferior to its predecessors, because the Master on/off switch is no longer present. Worse still, the master level control is in series with the headphone volume knob, so if the master is turned down to protect the audience during tuning or editing, the headphones are silent. This is daft, and I have no idea why Moog did it. I have listed all the Hidden Functions below. The manual categorises these differently — for example, filter envelope reset is shown in the modulation section — so I've re-ordered them in a way that I hope makes more sense. Oscillators & Mixer: Oscillator waveshaping destination; Oscillator 2 beat frequency; Oscillator gate reset; External input level. Filter: Slope; Envelope delay ; Envelope hold; Velocity to envelope amount; Velocity to envelope time; Envelope trigger mode; Envelope reset; Envelope repeat; Envelope keyboard amount; Envelope gate. Amplifier: Envelope delay; Envelope hold; Velocity to envelope amount; Velocity to envelope time; Envelope trigger mode; Envelope reset; Envelope repeat; Envelope gate. Performance: Keyboard transpose; Pitch-bend range up; Pitch-bend range down; Legato glide on/off; Glide type; Gated glide on/off. System Commands: Initialise preset; Initialise global parameters; Restore factory presets; Calibrate pitch; Send current preset; Send all presets. It sounds like a synthesizer should. The four filter responses considerably extend its sonic flexibility. It becomes even more flexible when you use the Hidden Functions fully. Despite being a production prototype, the unit operated faultlessly throughout the review. I really like the build quality. It was completely stable; I never needed to retune it. More than half of its parameters are buried in Shift Mode and Hidden Functions. The short keyboard precludes traditional synth soloing. A single LFO is rather limiting. If offers just 16 memories. The headphone level control is not independent of the signal level control. The Sub Phatty's diminutive footprint will appeal to players who have little space and no need for a larger keyboard, but less to those who play synths as soloing instruments. Likewise, the programming system won't bother players who are happy to hook it up to their computer to use the Hidden Functions, although it won't appeal to those who would prefer to use a more conventional, knob-per-function front-panel editing system. But however you view it, the Sub Phatty is perhaps the smallest synth ever to sound like a real Moog, not least because it is a real Moog. Moog Music +1828 251 0090.